Jimmy Carter's supremely sleazy accusation requires a solid, sound rebuke. It is an effort to place the President of the United States beyond criticism. Imagine if, before last year's election, someone had argued: If a black man becomes President, anyone who dares to criticize him will be called a racist. 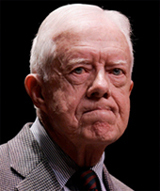 Jimmy Carter is doing something that, before the election, he would not have revealed that he planned to do. It is a low and despicable political move that he should be ashamed of. And since demanding apologies is all the rage, let me say that I would like the wizened old husk of a former President to beg our forgiveness.